David Archuleta burst into public consciousness at age 16 when he auditioned for 2007’s American Idol, singing John Mayer’s “Waiting on the World to Change.” His silken voice and amiable personality quickly won over the judges — Randy Jackson, Paula Abdul, and the notoriously hard-to-please Simon Cowell. Fast forward to the finale in which Archuleta and David Cook are the last two standing. 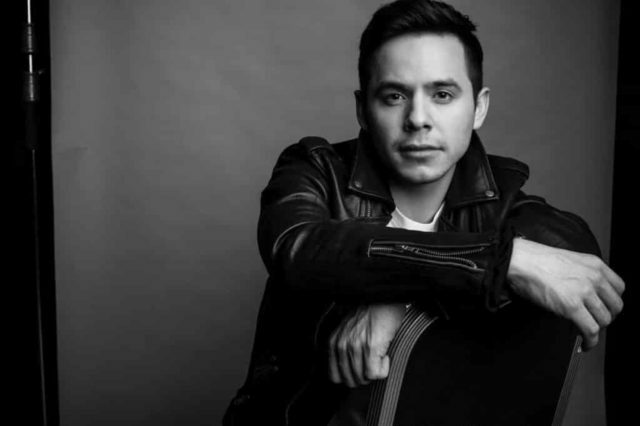 Although Cook took the title, Archuleta was a winner too — the television exposure garnered him millions of fans worldwide and offered him the opportunity to make singing his career. Today Archuleta is still wooing listeners with his gentle vibrato and pleasing tenor. In the past decade plus, Archuleta has played concerts around the world, did a two-year-stint in Chile to fulfill his Latter-Day Saint’s mission, and recorded a handful of albums. Currently, Archuleta, now 28, lives in Nashville and is touring and writing songs for a new album. I recently spoke over the phone with the singer, who was gracious, warm, and strikingly honest. The following is an edited version of our conversation. You’ve been doing this a long time. How’s it going after more than a decade? I can’t believe I’ve been doing this for than a decade….I feel really blessed to still be doing this, because that doesn’t have to always be the case. And the fact that I can still keep working through creating new music and having an audience to listen to it and being able to go on the road and do shows still, I think it’s a really neat … I’m thankful that people still care to come and listen to my songs and come to the shows. I think that’s pretty amazing too, just that people still are following me. The fans are still around. You’re probably gathering new fans as well as you continue to put out albums. I think that’s what’s really cool about working, to just keep staying consistent and releasing music, keep going out and doing shows that new people come [to]. It’s pretty interesting. It’s weird that people … even there’ll be like little fans that come and it’s like wait a second, you weren’t born when I was on American Idol. And they have … they know the new songs and that’s kind of cool. I’m like like whoa, that’s pretty awesome. Do you get tired of talking about American Idol, which you were on more than 10 years ago? I don’t really. At least not now. Maybe right after because I was overloaded….When you’re on American Idol, you feel like you’ve lived three times, maybe five times the amount versus the time that actually took place. There’s just so much going on. And you’re interacting with so many people. You’re in front of so many people every week. You’re getting critiqued and judged and you’re just putting yourself in a very vulnerable place every week…it’s not just your singing. It’s if you’re likable, if you are dressed funny or not, if you said something that people don’t like. Or if people just find you annoying. ….You feel so vulnerable. Not to mention everything that you have to do through the week behind the scenes. There’s so much going on there as well. Not just working, but prepping and giving so much of yourself to millions of people….It’s just so unreal. How do celebrities deal with this? I can see why they go crazy now.…I remember we’d be out till 2 in the morning and then we’d have to get up at 6. And then I had school everyday … I hadn’t graduated from high school yet. … it was a lot of work. So, the couple of years after, it’d make me shake every time I heard [America Idol]…Not that it was a terrible experience, it was just so much. I didn’t even realize what had happened, what I had actually done until a year after [when] I was able to look back and be like wait a second, I actually did all of that….Now 11 years later, it’s like whoa….look where I’m at now because of that….I’m able to connect with people still 11 years later and it’s a positive connection….It blows my mind that I’m in people’s memories as a positive experience. No wonder it takes several years to wrap your head around it. One of my friends is on this season. She’s in the top 20. Her name’s Ashley Hess. ….She posted on her Instagram how … she had cried off all of her mascara because she said, “There’s just so much to deal with behind the scenes emotionally…I wasn’t ready for this.” It’s amazing, and it’s so cool to be here she said, but she wanted to show both sides….I love that social media [allows] you to be so personal. I couldn’t have done that 11 years ago. …I was like, you took out, “You took the words out of 17-year-old me. [Laughs]. I think every person on my season had a nervous breakdown at some point. And we didn’t even know why. We didn’t know what was going on, but in the end it all worked out. You spent time in the Philippines. How did that come about? [In] the Philippines [singing competitions] are huge…. They loved American Idol. They really were huge fans of our season as well — the David [Cook] versus David [Archuleta] was a huge thing in the Philippines. So we went over there and it was crazy….We got off the airplane and [employees] were leaving their counters…and mobbing [us]. Following us out of the airport, leaving people at the desk that they were checking in. …Wherever we had appearances there was thousands of people. And at our show there were tens of thousands of people….They love pop music. And they’ve always been really supportive of what I do…. [I was asked] to a miniseries [there] and I said, no, that’s weird. I’m not an actor. …I was about to take a break from music for a couple of years to be a missionary for my church. And [then] I just said, “Why not? I’m just going to do it.” So I …recorded this miniseries. and while I was there, I recorded an album of songs by Filipino artists…as a thank you to the fans there in the Philippines…It was a thank you to the Filipino people for such a wonderful experience and memory and friendships I now have. How do you deal with people feeling they know you well because of your TV appearance, but to you they’re really strangers? It seems to me American Idol gave you some great life lessons. You have a lot of wisdom. Oh, thank you….I’m grateful to my parents for that as well…the principles that they taught me, like [to] remember what matters most. They would just say, “What kind of life do you want to live? I think they kept me grounded. Is your life going in the direction that you’re happy with or do you want to shift gears and do something else? I think what helped me a lot was when I did take a break — I was gone for two years. I didn’t do anything other than just missionary work in Chile, South America. And a lot of people that I worked with and just what is the word? Not colleagues, would be like that’s not what you do. You’re an entertainer, you stay where you are and you keep giving to people as long as they allow you to because it’s not up to you whether people are going to listen or not. Supply while there’s a demand….If you leave, you might not have anything to come back to. I was like okay, that makes a lot of sense. Maybe I shouldn’t be doing this. But at the same time, I knew I needed it. …For me spirituality is so important…and coming back from that, it was kind of like starting over again. … I got to ask myself … is this what I want to do? I didn’t have a choice to decide that before because I went from auditioning for a TV show out of curiosity to becoming a recording artist, which it wasn’t something I was dreaming about doing. It was just something that happened. …. I started writing again, and I was like I want to give this another go…Postcards in the Sky was the first album I released. I did it independently. And so now I know what that’s like. Now I wonder if I should try and start releasing radio friendly music again…. I didn’t bother trying to get radio friendly music on this last album. I just wanted it to be purpose, meaningful, personal. …I feel like I get what kind of artist I want to be, so let me try and make more commercial friendly music. And so that’s where I’m at now. And it’s an exciting place to be for me. …I’m looking forward to whatever happens next. I don’t know what’ll happen, but I feel motivated and I feel like if I have a motivation and I have a vision, then it’ll take me somewhere. So, let’s see where it goes. David Archuleta and his band play Tuesday, April 16, at the Lobero Theater (33 E. Canon Perdido St.). Call 963-0761or see lobero.org.